In previous discussion we came across different parser for xml in Java and a brief introduction of them. In today?s discussion we will see how to parse an xml in java using dom xml parser. DOM so called (Domain object model) is the most commonly used and easiest implementation to parse an xml in java. DOM loads the xml tree into memory before parsing it, this is the reason we need to have a large heap size to eliminate memory exceptions. In case we have a large xml to parse it is better to use SAX instead of DOM, because loading a large xml in memory is not a good choice. DOM is already a part of JDK, hence we don?t need to add any external jar to start with DOM. Here is the overall project structure for today's discussion, we have two folders here 'createdFiles' contains xml that we have created from xml object and 'xmlFiles' contains an xml file that we will read using dom and show the contents on console. 'CreateXml.java' contains code to create xml file in java and 'ReadXml.java' contains code to read xml file in java dom. Reading xml in java using DOM parser is simplest process compare to all other parsers. 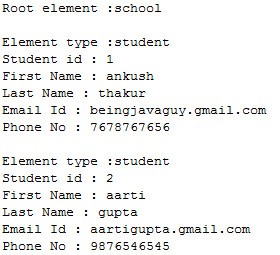 This is the sample xml file that we will read and show the content on console. Simple java class to parse the given xml file and print the data on console. 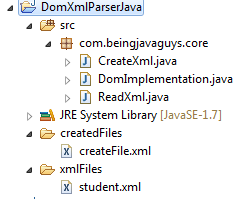 Creating xml file in java using DOM parser is simplest process compare to all other parsers. This is a sample xml file, we will try to create a xml file like this. This is a simple java class where we have written code to create an xml file from java object. The code is quit simple and is explained with comments on every line. This is simple java class with a main method, we have create two objects and called the required methods simply to see the output. In this particular blog we cam across 'How to read xml file in java using DOM' and 'How to create a xml file in Java using DOM'. In upcoming blogs we will coma across more about java xml parsers and their implementation. Read more about XML & JSON under SAX & JDOM2 & XML parser in Java JSON, and JAXB - Marshalling & Unmarshalling in Java categories.